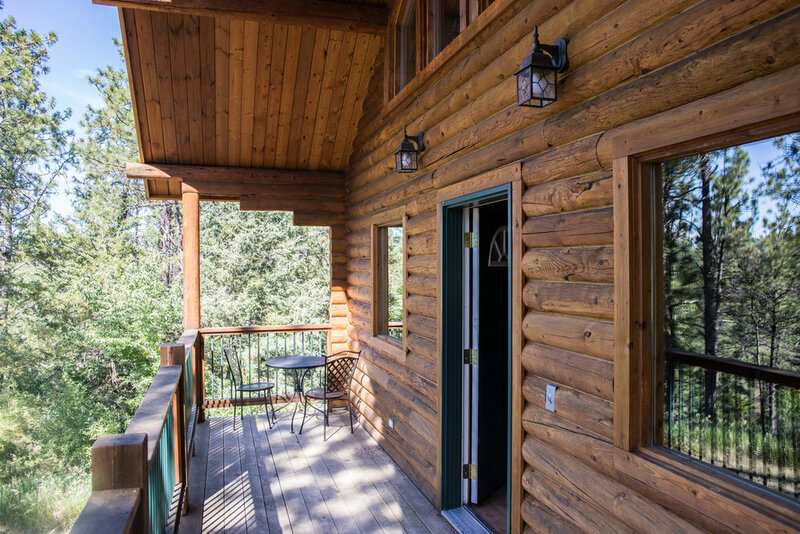 Our cabins are a peaceful getaway from the hustle and bustle of everyday life. 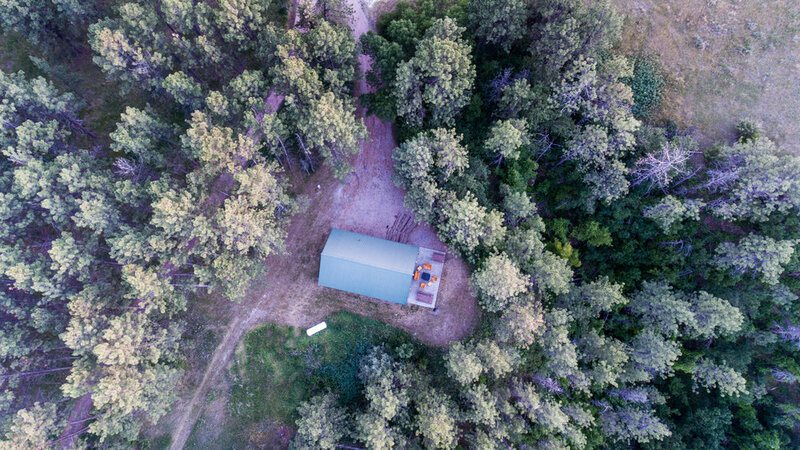 All of our fully-furnished cabins are nestled in a native Pine forest and have amazing views of nature in every direction. 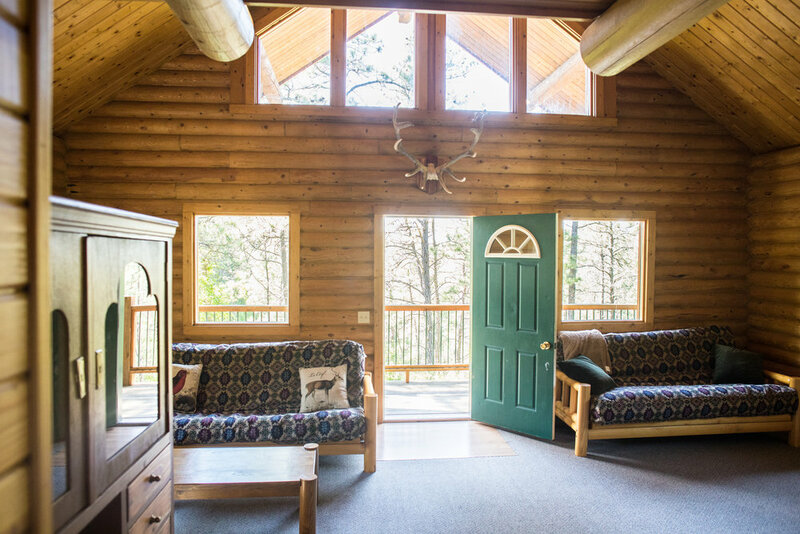 The layout of the cabins is equally perfect for a quiet family getaway, a retreat, or a family reunion. 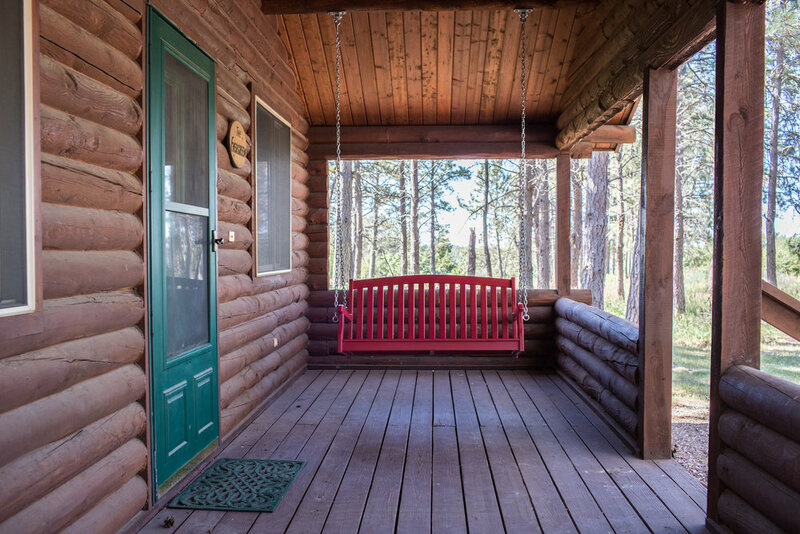 All of the cabins have easy access to hiking trails, trout-stocked fishing ponds, scenic overlooks, volleyball, horseshoes, shuffleboard, and a playground. 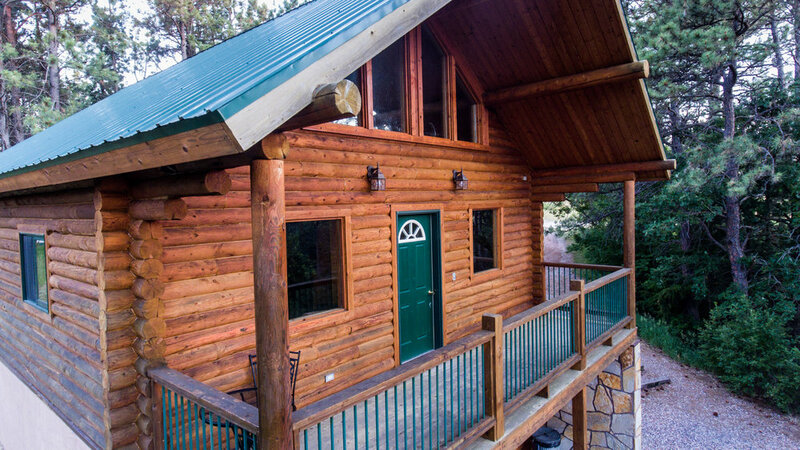 Stone House- Nestled quietly in the woods, this spacious cabin sleeps 14 people and has 4 private bedrooms, 3 futons, and 2 bathrooms. 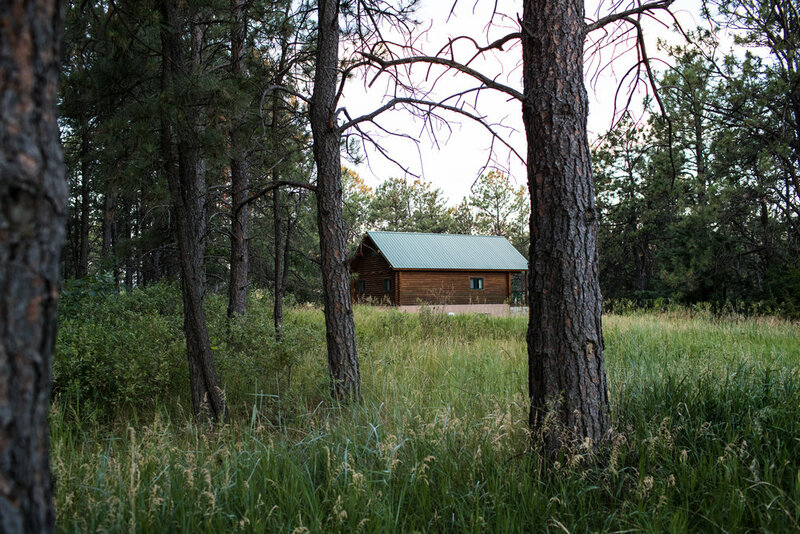 The Spruce and Evergreen cabins both sleep 6 people and have two private bedrooms, 1 futon, and one bathroom. 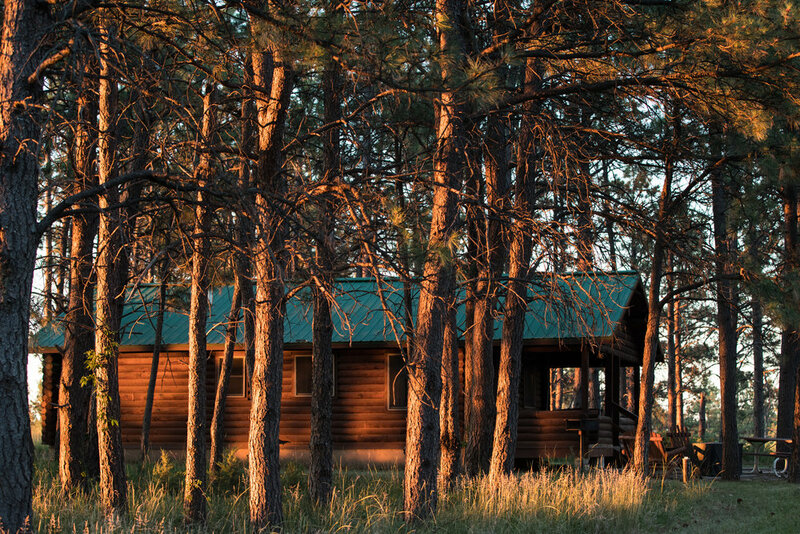 Sunrise through the pines at the Evergreen Cabin. 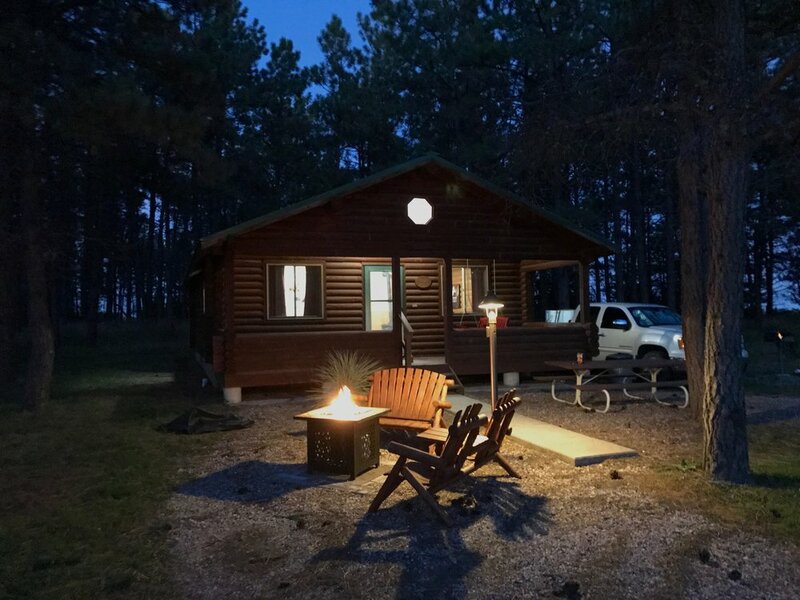 The Spruce and Evergreen cabins are pretty close to identical in size and design and are conveniently located about 100 yards apart from each other. 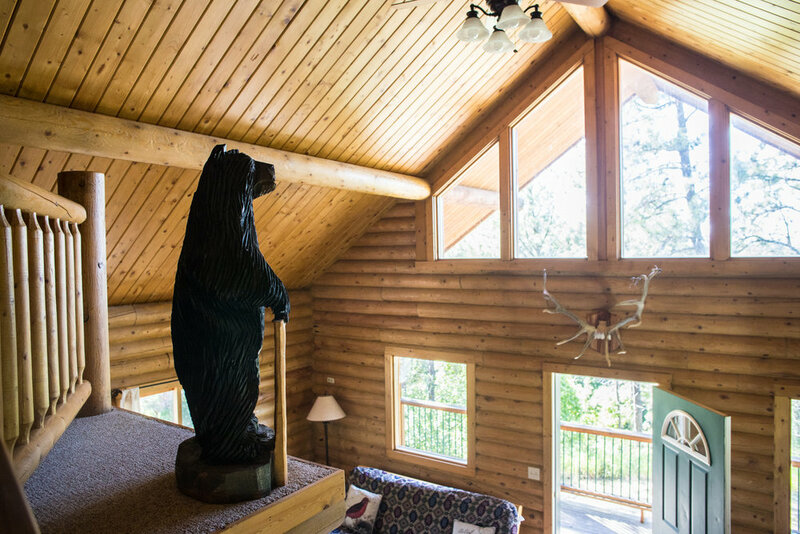 The Loft Cabin- Secluded and peaceful, the Loft Cabin House sleeps 12 people and has 2 bedrooms- one has a queen bed and one has a queen and bunk beds. Also has upper level loft with queen bed and futon. Another futon is available and can be used in main floor living area. View from the deck of the Loft Cabin. Nothing but pure Nebraska awesomeness: canyons, native grasses, pine forests, and big skies. The Stable Quarters is a one-of-a-kind studio apartment located above the stables. Nice and quiet with room for four people. One queen bed as well as one futon and one bathroom. We promise it doesn't smell like, well, horses. Great spot with an amazing view! View from the deck at the Stable Quarters cabin. And here's a little map of the cabin area of the ranch so you don't get lost. A nonrefundable deposit in the amount of the first night stay is required. This nonrefundable deposit must be paid for with a credit card. Any cancellations made one week or less prior to reservation will be charged the entire reservation price. Sorry, no exceptions on this policy. We do not allow tent camping; for insurance reasons we have to stick to our maximum occupancy and cannot have extra people tenting in the cabin area. Due to recent wildfires, smoking and campfires are NOT permitted on Heartland Elk Guest Ranch property. Don't worry, we have real nice gas and charcoal grills at the cabins for your convenience. No pets allowed...unless your pet is a horse and you made arrangements to board your horse at our stable during your stay. 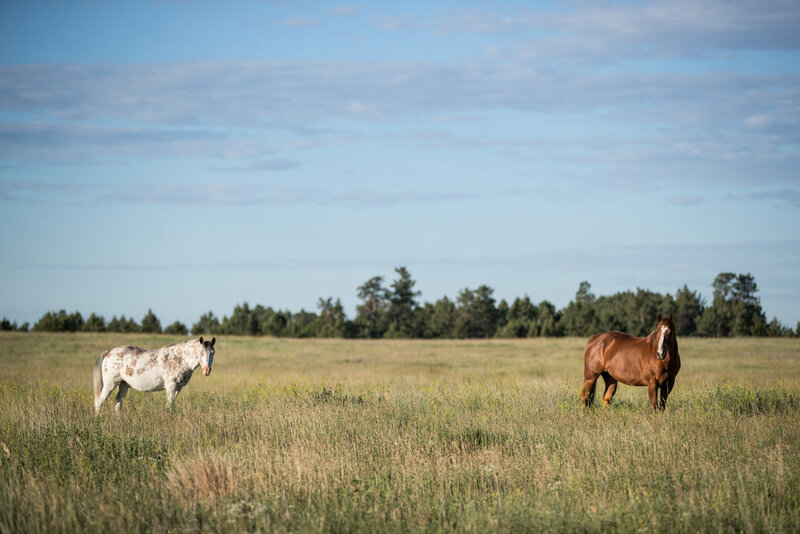 And most importantly, there are no TVs or Wifi at the ranch so that you can unplug and enjoy your time here to the fullest!. There are additional charges based on total guest count in the each cabin. For Spruce, Evergreen, and Stable Quarters, if your guest count is over over 2 adults, please add $25 per adult and/or $10 per child (ages 6-18). For Stone House and Loft, if your guest count is over over 4 adults, please add $25 per adult and/or $10 per child (ages 6-18). Ready to book? Start here. Like the images and video on this site? Everything is produced and copyrighted by Admiral District (www.admiraldistrict.com) and may not be used without written permission. Thanks!